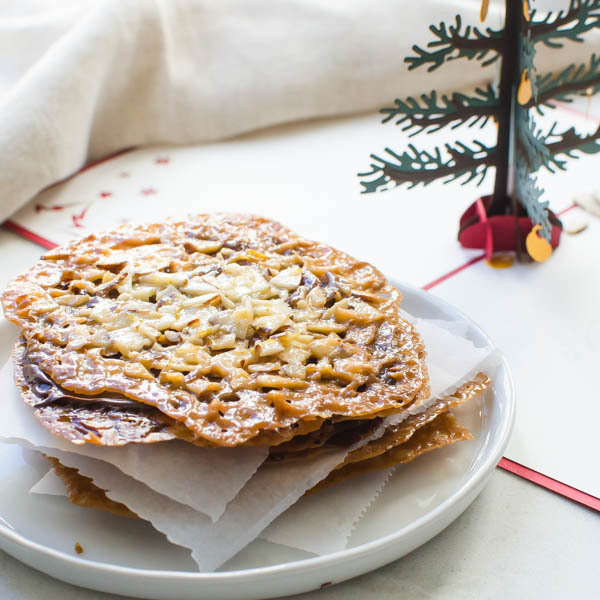 With only ten days to go until Christmas, I thought you might like another cookie recipe and this one’s a doozy! 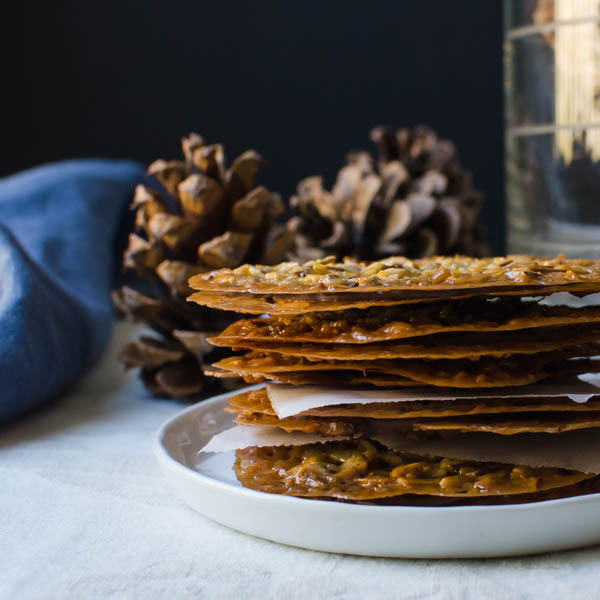 These chocolate almond florentines exemplify everything you’ll love in a cookie — lighter than air, delicate, crispy, buttery with a light citrus and caramel note and just a skosh of chocolate. 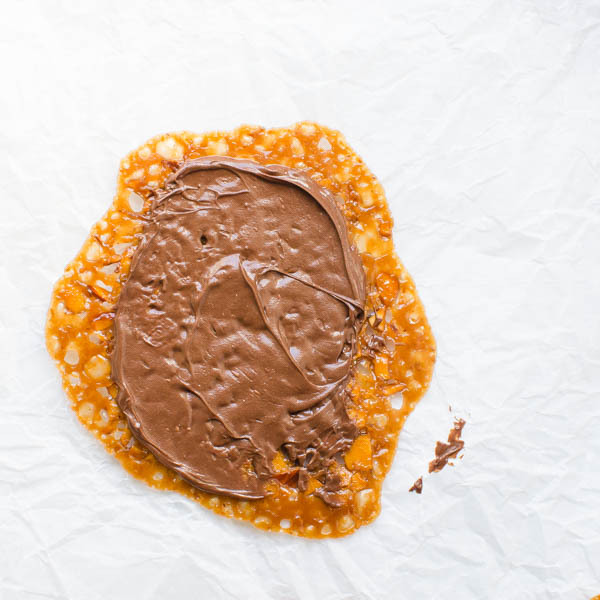 This recipe is from Giada De Laurentiis and makes a seriously delicious treat – but I wouldn’t recommend making them for a crowd. Instead make them for you and your family to hoard. Not because they’re particularly difficult, but they do take a bit of time — and it’s not quite as simple as “bake for 12-15 minutes until golden brown”. The “time” part of the equation is because you can only make about 4 cookies at per batch. I used a half sheet pan lined with parchment (using new parchment for every round of baking) and even though each batch is finished baking in 8-10 minutes, it’s the number of batches that require the time commitment. Patience pays, though. If you put too many on one sheet pan, they’ll spread right into each other, yielding a large, sweet blob. 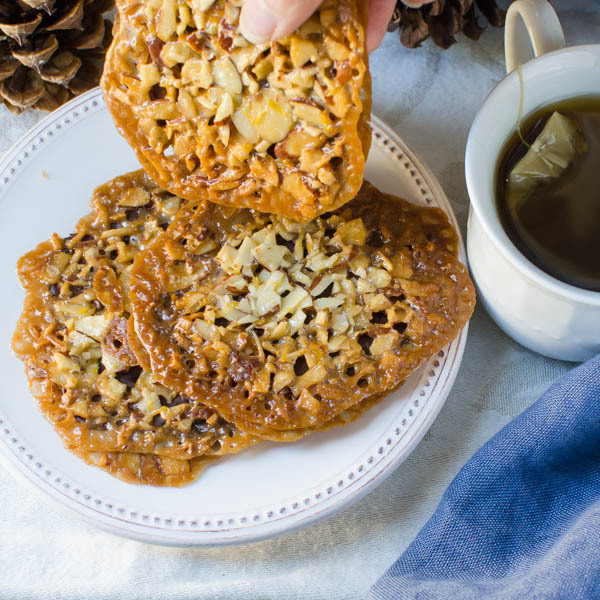 When these cookies bake, they are so thin, lacy and brittle, you need to be careful when handling them. Let them cool for a few minutes on the parchment until they harden up. Then transfer the cookies to a paper towel to soak up any excess butter. 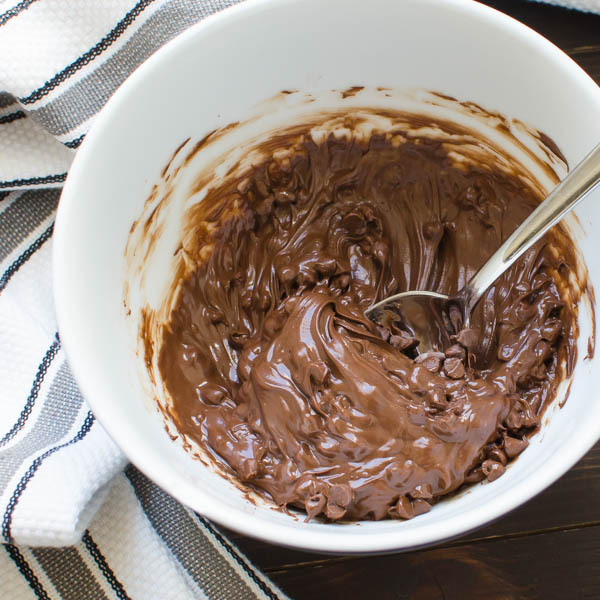 Melt chocolate chips or a good quality chocolate bar over a double boiler (or cheat like me and do it in the microwave in 10-15 second bursts). 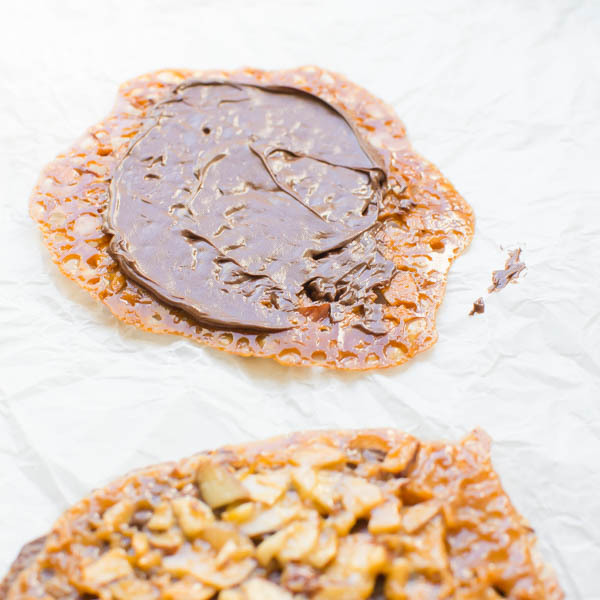 Use an offset spatula (if you have one) to spread a thin layer of chocolate over the back side of one cookie. Then top it with a second cookie and lightly press them together. Let the chocolate cool to a solid (usually 1-2 hours) then stack the cookies loosely in an airtight container (separating each layer with parchment paper so they don’t stick together. Look at how ridiculously thin they are! One taste and you’ll be hooked. Guaranteed. The only caveat is how delicate they are — which makes them bad choices for shipping and gifting, but a good choice for you and/or Santa to enjoy at home. 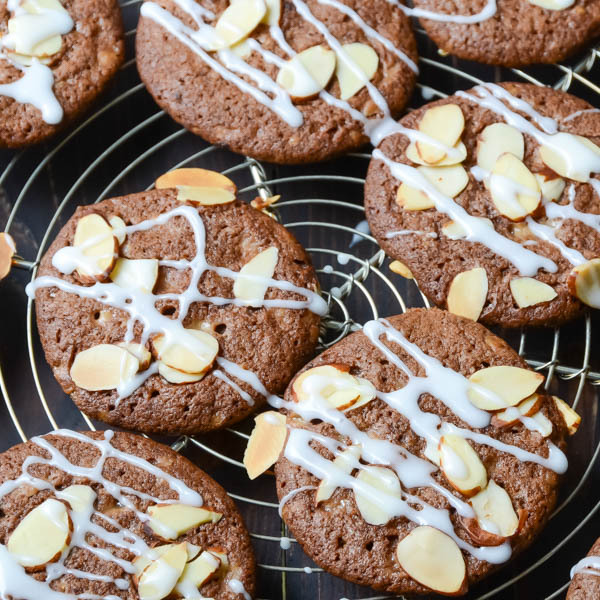 Buttery, crisp and totally indulgent orange-almond lace cookies filled with semi-sweet chocolate. Adjust oven rack to center of the oven. Preheat oven to 350°. 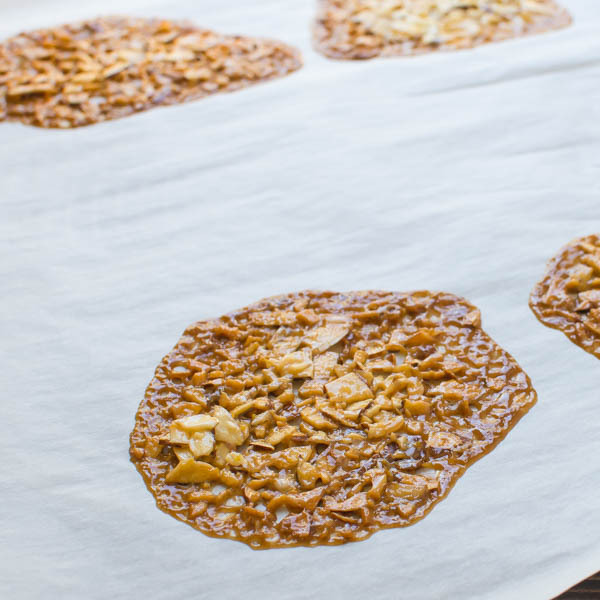 Arrange parchment paper on a large baking sheet and set aside. 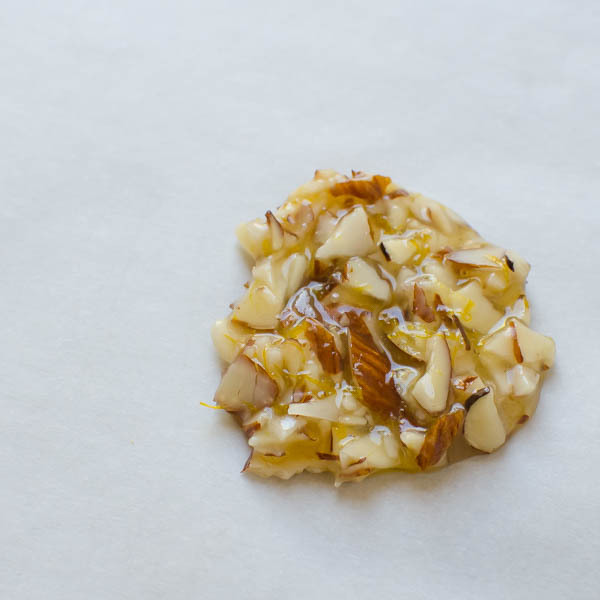 In a medium bowl combine the almonds, flour and orange zest. Toss to combine. Set aside. 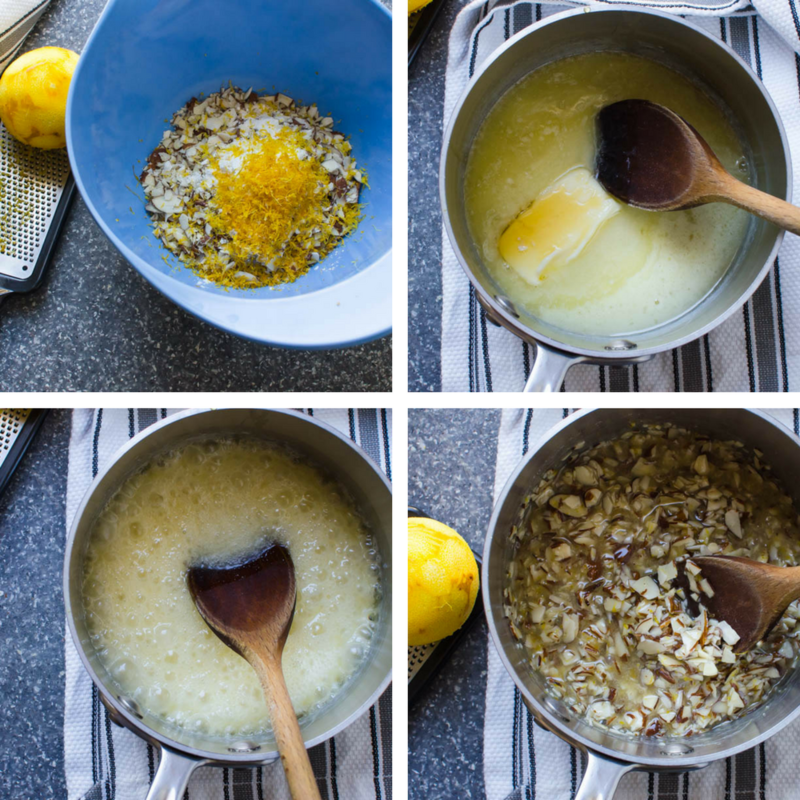 In a medium saucepan, heat together the sugar, salt, butter, whipping cream and honey. Bring to a rolling boil until the sugar has dissolved. Remove from heat and add the almond mixture. Stir to combine. Use a one teaspoon measure to drop exactly 2 teaspoons of batter into mounds at least 3" apart on the cookie sheet. Wet your finger tips with water and flatten out each mound (water prevents your fingers from sticking to the dough). Bake for 8-10 minutes or until golden brown. 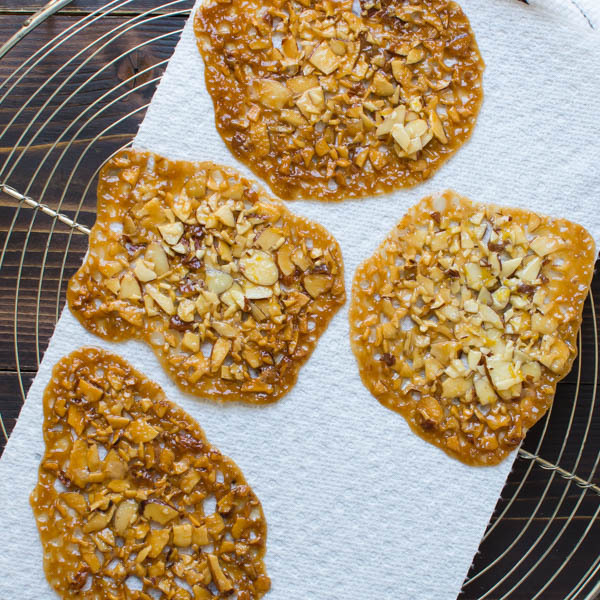 Transfer the parchment paper with the cookies onto a wire rack and cool until room temperature. 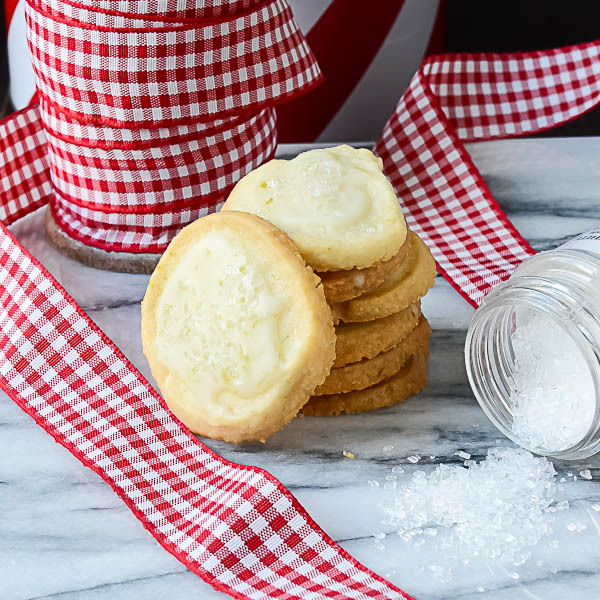 Transfer cookies to a baking sheet lined with paper towels to soak up excess butter. 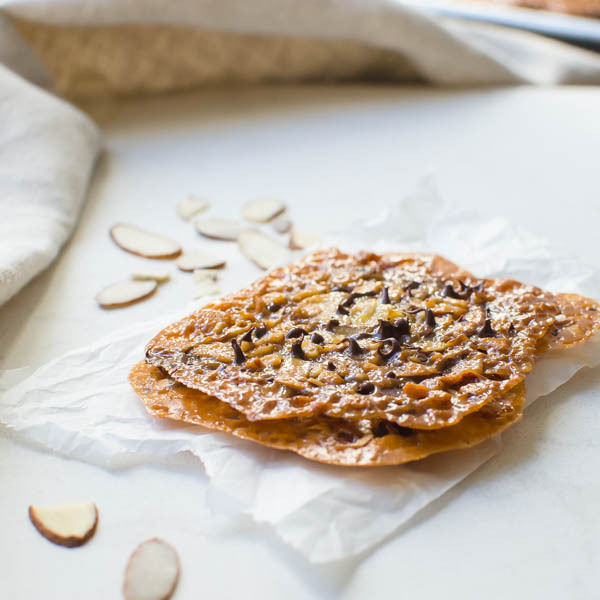 Continue making the cookies in this manner using a fresh sheet of parchment paper each time for cookies to bake on. When cookies are cooked and cooled, use an offset spatula to smooth the melted chocolate onto one the baking sheet side of the cookies. Top with another florentine round and set aside to harden, several hours. This recipe looks delish & easy to make. I haven’t had Florentine since before. Would give these stars a try. Thanks. These cookies look so delicious. I love almonds and chocolate, I will have to make these soon. Wow – I remember having these cookies and they were so good! Your version looks delicious! Santa would love these! omg Lisa I love you. Every year I buy these at Costco during the holidays. 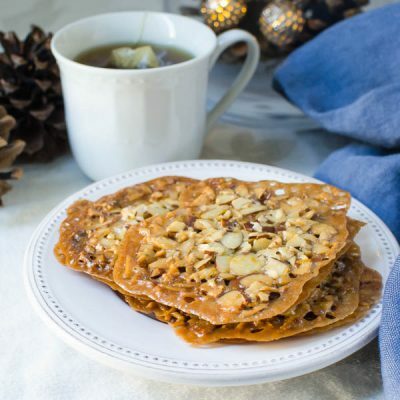 They don’t call them florentines so I never knew what they were really called but they are super duper expensive. I am definitely making this next week! So freakin’ excited! 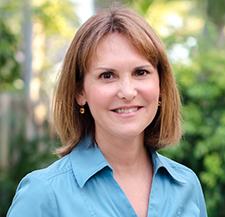 Have fun with them, Joyce! I love those cookies. I didn’t realize they were so easy to make. These are so tasty looking! 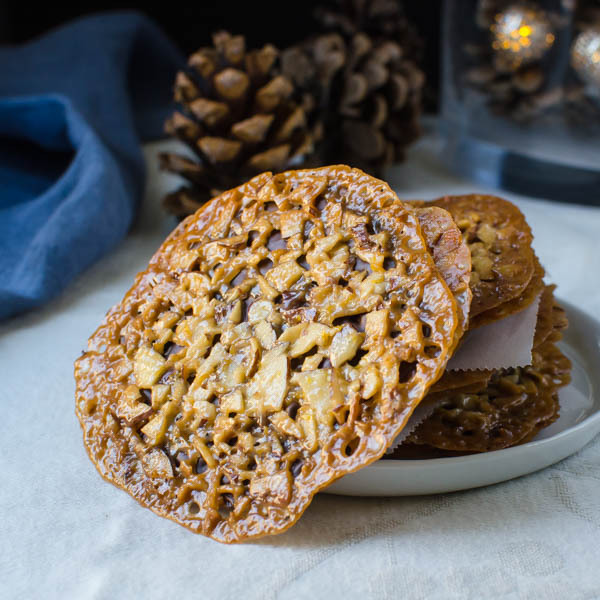 I’ve been searching for something to make for a cookie exchange party I have this weekend and as I love the combination of chocolate and almond, this is moving to the top of my list! 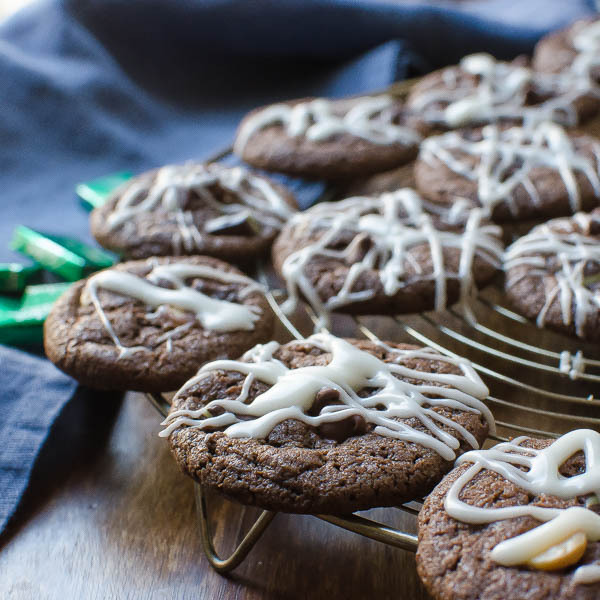 A cookie exchange sounds like fun! Enjoy!